Next month, I will be speaking in a fundraising entitled “Open Hearts, Big Dreams” to help build a school in Addis Ababa, Ethiopia. The fundraising will help build a school in my neighborhood “Mercato” for needy children. For a person who visited Ethiopia or raised in Ethiopia, Mercato is very familiar place. 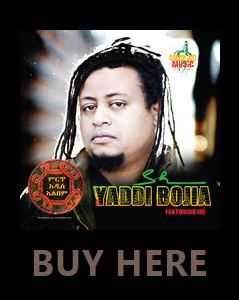 It is one of the biggest open markets in Africa and anything under God’s sun is for sale. This might seem an exaggeration but it is true. In Mercato. food of any kind , jewelery, liquor, coffee, cloth, building material, auto parts, spices, and so on are for sale. In night-time, Mercato is also a place of drinking, party, prostitution and crime. Think of a mixture of Ghetto, French corner, and China town all in one place. Mercato is also a hope for a lot of families in Addis. If you are hard-working and honest mercato will give you something to take home to your children. It is a place of hustle. With its unforgettable aroma and loud noise Mercato leave a lasting memory in everyone that visited. As the same time kids in Mercato have such a tough life. Lack of school, library, parents, safe playing area and safe environment, made life unbearable for most. without a proper school and school materials, children in Mercato will be exposed to child labor, prostitution, and begging. If there is a place in the world that needs immediate help for its children, Mercato will without doubt be in top 10. That is why I am excited and happy to participate in the fundraising for the upcoming event. It is right, personal and appropriate. It is appropriate because eduction is the light. It is not a fundraising that helps to buy pencil or temporary help, it focuses on education, the only light out of the darkness of Mercato. This is about teaching kids so that they can go back to their neighborhood and help educate their fellow brothers and sisters. It is about shining the light of hope and it is about exposing the beautiful faces in the bottomless pit of Mercato. Here is the painting I finished that will be auctioned in the fundraising. Half of the proceed will go the cause. This painting is called “Berhan” and it means light. Hope you join us and help children in Mercato. Dream Big, Dream Peace and Work hard to acheive it! Five month ago, I received an interesting request from Ellenore Angelidis ( a friend I came to know for her love and dedication to Ethiopian related causes and her blog http://ethiopianties.blogspot.com/. ) 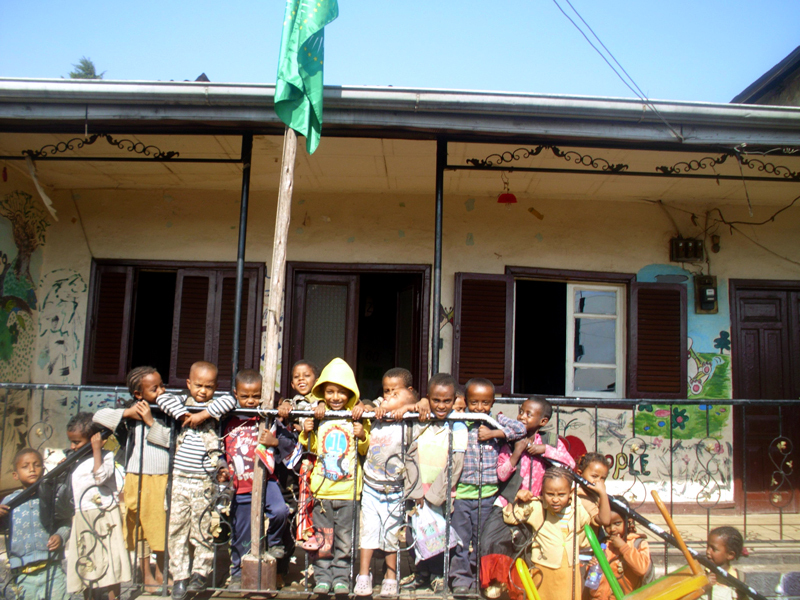 to write a letter for children in Marcato area of Addis Ababa to encourage them to study hard. I was very much surprised by her request because I never considered anything I do as an inspiration to others rather as a self expression. Ellenore was in her way to visit the school with her entire family to deliver books and visit a library she help fund from her fund-raising efforts. I was very proud of her accomplishment and felt a person they need to emulate is her not me. So some how, she eccouraged me to agree to her proposition and I wrote the following letter in Amharic (Ethiopian National Language) to them. 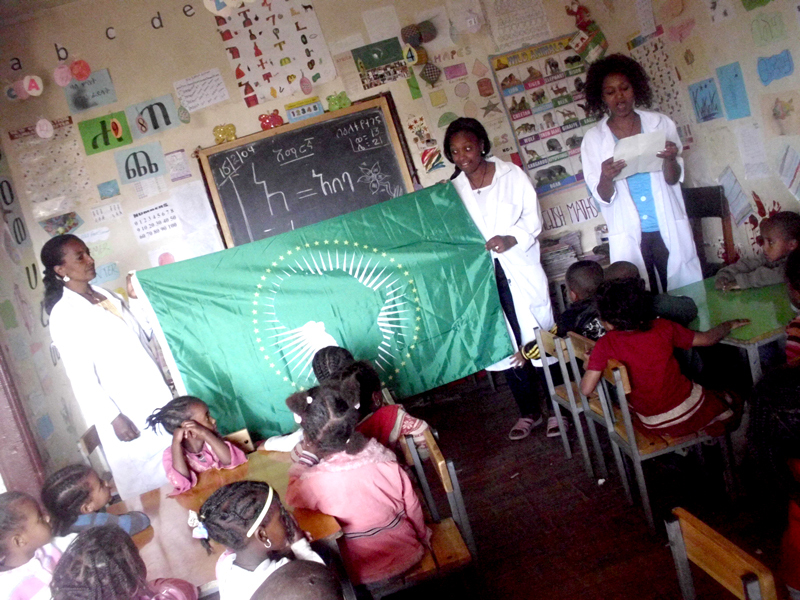 I also send them a signed African Union flag that I designed. Today, I received a photo from the school I attached here. It was very moving to see the pictures of young boys and girl in their classroom listening to their teacher reading my letter to them. I am very honored and moved for being able to be in their life in such a small way. Ellenore returned back to Seattle with renewed sense of urgency to do more for her friends across the ocean. In collaboration with Ethiopia Reads, she is planing a fund-raising titled Open Hearts, Big Dreams. A theme inspired by the letter I wrote to the students and her and Jane Kurtz’s Open Heart idea. I will be a speaker in the fund-raising with the renowned children book author and Ethiopia raised Jane Kurtz. I hope you will join us and help this great cause. May be this is will be one of your holiday charitable activity! In today’s world, where science and technology is at its highest peak, I know you feel the lack of school materials and all the basic necessities around you might keep you from playing a vital role in your country as well as community. But just like Mandela said, education will help you to win the battle. Dear students, with education there is no mountain you can’t climb and there is no dream you can’t achieve. You are defined not by the poverty and struggle around you but by the effort you put to better yourself. When I was a little kid, I used to worry about my future until I understood education is my ticket out of poverty. The poverty around me pushed me to be dedicated to my goals. Instead of discouraging me, hinder me from dreaming, it pushed me to go after my dream. So I beg you and urge you to seek education to change your future and your country’s future. You are tomorrow’s leaders and your dedication will better it for generations to come. Dream big! Dream peace! And work hard to achieve it! !